The 2019 JAMB novel Sweet sixteen written by Bolaji Abdullahi is one of the best text ever recommended for the Joint Admission Matriculation Board (JAMB), the text is a short one but it is very interesting, it has 53 pages. 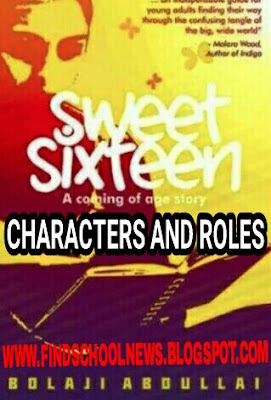 Although we have posted our summary version of the novel read now Jamb Sweet sixteen summary; so today we will be listing out the characters in the text and the role they played. Bobo is Aliya classmate, He gave Aliya a Teddy bear on Valentine’s Day, later on he traveled to Ireland. He is a Journalist, a husband to Mrs Bello, son to Big Mummy and also the Father of Aliya. He loves Aliya so much in the text, he shows her fatherly care and also keeps eyes on her as she grows up. She is a nurse, wife of Mr Bello and also the Mother of Alayi, she loved her father but she was not very close to her daughter as Mr Bello did. He was regarded as a brilliant boy and also as a joke cracking boy, He is also Aliya classmate. She is Mr Bello Mother, which makes her Aliya's grandmother and also Mrs Bello mother in law. She is the mathematics teacher, and also the one that punished Akin in novel. She is a senior in Aliya school, she always bullies Aliya in school. A regarded as aproud boy in Aliya's school, he was also the one who gave Aliya a love short note. A classmate to Aliya, his father said he will study law because he is also a lawyer. She is Aliya’s roommate who does not like to talk. The principal of Aliya's school, he was an older man when compared to Mr Bello and he is a Christian from Tiv. She is a Biology Teacher in Aliya's school, she calls Aliya Fatima. Rebecca is Aliya's classmates she provoked her with religion and terrorism thoughts. She is the girl who tried tricking Aliya from running to the Principal’s office in School. Thanks for reading this post and i hope it was helpful. If you have any questions please feel free to ask through the comment box.